Sustainable building isn't a gimmick or buzzword to us--it's part of who we are. As a cornerstone of our core beliefs, Sota Construction has been practicing high performance and green building approaches on our projects since our inception in 1993. In fact, our company headquarters is a LEED Platinum building--the fourth highest-rated building in the world by total points at the time of its completion--so we don't just practice green building, we live it, too. 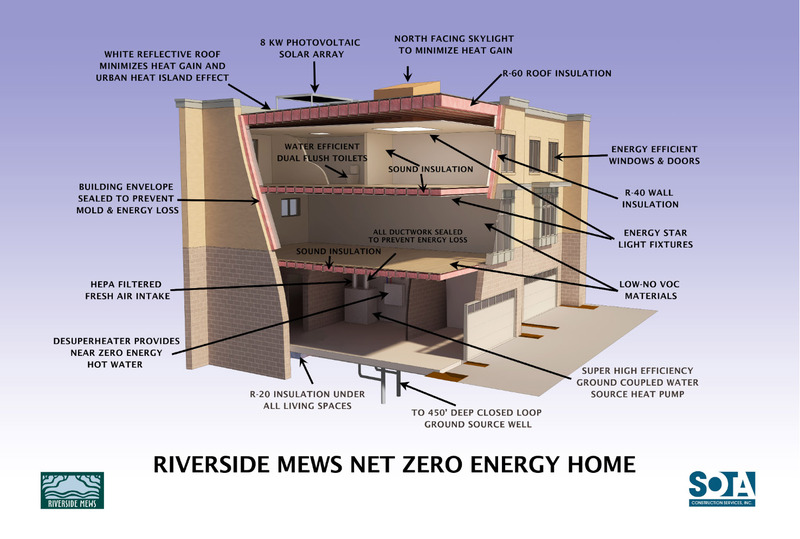 We are a leading regional provider of sophisticated, cost-effective sustainable buildings, with our experience ranging widely over the decades from LEED, Energy Star, and now including Passive House. As part of our commitment to better and healthier buildings, we are a financial supporter of the Green Building Alliance and Conservation Consultants, Inc., in Pittsburgh and have been a long-time member of the United States Green Building Council. Our president, Ernie Sota, has been involved in sustainable approaches to construction since 1977, creating one of Pittsburgh's very first green buildings in the Roland Street Urban Rooftop Bio-shelter. He is a registered LEED professional as well as a certified Passive House builder (along with our vice president, Phil Ford). Though not every project may have a goal of LEED- or Passive House-certification, as a member of a project team and as part of our ever-present commitment to Total Quality Construction™, Sota Construction can offer easy and often cost-saving sustainable opportunities that can affect both the short- and long-term bottom lines of the project. 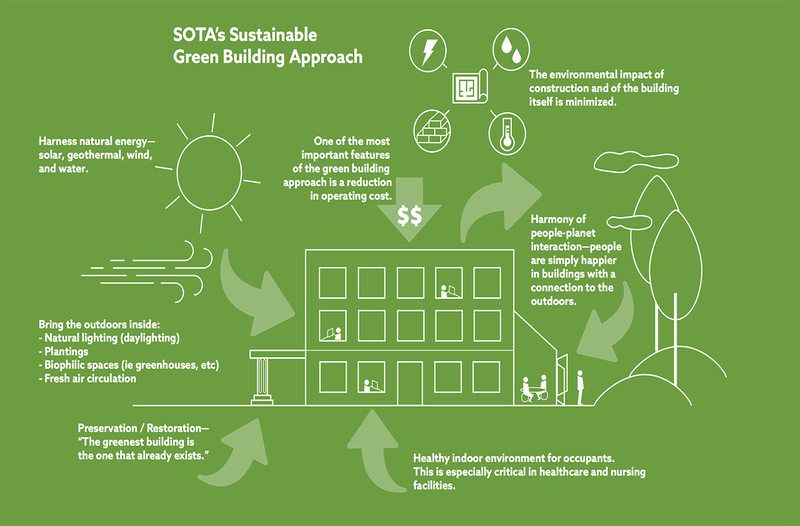 Whether it's anything from recycling construction waste, selecting the most efficient mechanical systems, improving the building envelope, or choosing energy-saving light fixtures, Sota can offer practical sustainable solutions for just about any project. 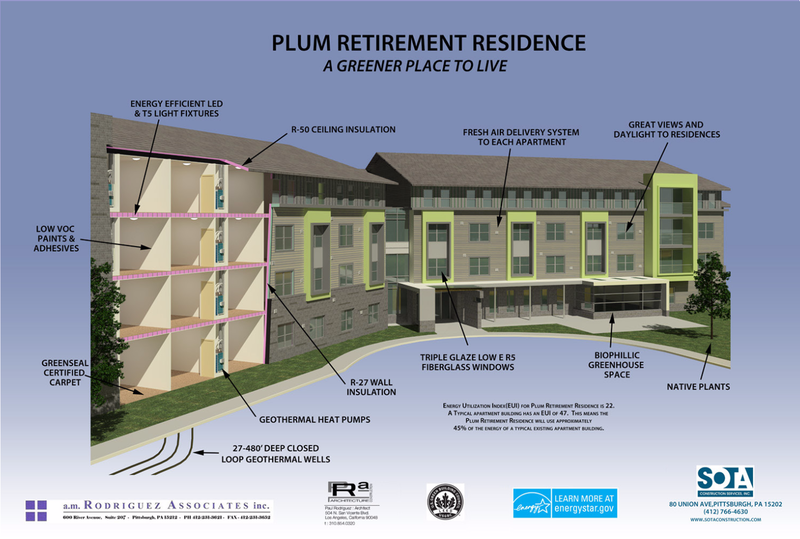 Below are cross-sections of some of our most innovative and cutting-edge sustainable projects, including Pittsburgh's first-ever Net Zero home and the remarkably efficient Plum Retirement Residence, that showcase our expertise in green construction. They are always on a recommended contractor list.